Hiking in the mountains is just one of Rich Meier's many interests, pictured here at Mount Rainier in Washington State. Focused but far from one-dimensional, Rich Meier chose engineering to be his main priority of his varied interests and talents. Even though he had scholarship offers to play football at other colleges, he didn’t think twice about coming to Oregon State for the engineering program. “I never switched majors. I always knew that I wanted to pursue electrical engineering,” says the senior in the School of Electrical Engineering and Computer Science (EECS), explaining that his interest was first inspired by his high school physics and computer science teacher. “I had this idea that I would develop the next green car or figure out some new way to generate and capture electricity. I've always been really excited about that,” he says. Meier’s college career has been focused on this goal. He spent last summer at the National Renewable Energy Laboratory in Golden, Colorado researching wave energy. And his senior design project which won the People’s Choice Award at the Engineering Expo, captures mechanical energy from the force of the foot striking the ground with piezoelectric sensors in a shoe. Advised by Patrick Chiang, Meier, along with his group members, developed a system to collect force data at six different points from the heel to the toe using the harvested energy. The data could be used in gait analysis for the purpose of improving how people walk, run or jump. But the most interesting part for Meier is that he is working on his dream of a capturing renewable energy. “I’ve always really wanted to be able to generate electricity in a way that doesn't mess up the earth,” he says. Meier must have some secret to generating his own energy given the number of interests he continues to pursue. 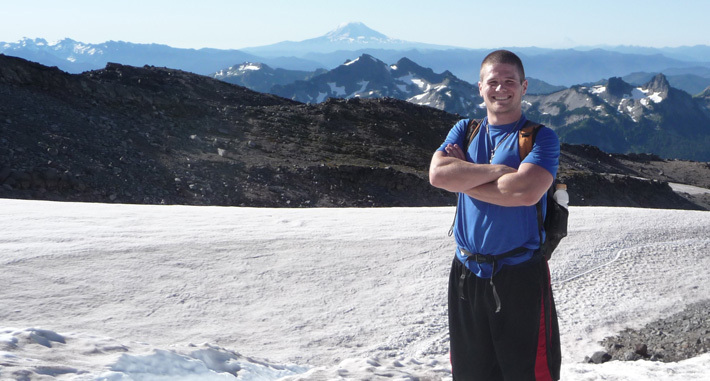 He grew up with a great appreciation for being outdoors — backpacking in the Puget Sound area of Washington State where he grew up, and playing every sport imaginable. He hasn’t lost that enthusiasm. Meier says one of the “coolest experiences” of being in Colorado over the summer was climbing his first 14,000 foot peak. And although sports have taken a back seat, his intramural golf team won the final tournament last year, and he is training to compete in his first triathlon this summer. But his interests don’t end there. “Music is one of my big passions. I love it. Absolutely love it,” Meier says. He played trumpet starting in the fifth grade and had some amazing opportunities to perform including a three-week tour in Europe with a 100-piece wind ensemble and a solo performance of the national anthem for a San Francisco Giants baseball game. Although he put down the trumpet in college he couldn’t stay away from music and picked up a guitar instead, teaching himself to play well enough that he joined a Christian rock band for a while. He started taking voice lessons to improve his singing, and last year he got a “crazy idea” to try out for an Oregon State choir. 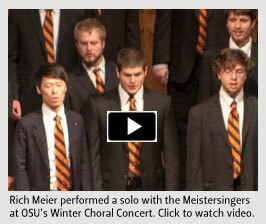 “I made it into the Meistersinger’s which is the men’s choir,” he says incredulously. Not only did he make it in, but he performed a solo for OSU’s Winter concert and on tour at The Lincoln Center in New York. Even though he has been very successful in music he still sees it as a hobby and a way to get a break from engineering. For the past three years Meier has also worked as a teaching assistant for the introductory electrical and computer engineering classes which, he says, has been a great experience. “It gives me grounding because I can see how much I've learned,” Meier says, recalling as a freshman he struggled with his solar powered TekBot, a basic robot the students build in the introductory classes. “Now I can troubleshoot a complex piezoelectric harvesting project,” he says. His accomplishment at OSU earned Meier honorable mention for the Waldo-Cummings Outstanding Student Award. 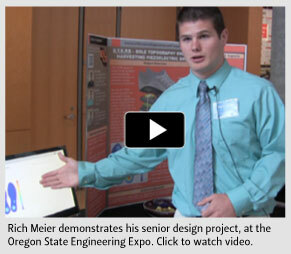 Meier plans to stay at Oregon State for graduate school and work on integration of large-scale renewables — such as wind, solar, and wave — as well as smart grid technologies. He will be working with the Energy Systems group in the School of EECS which has the highest power and best equipped lab of its kind at any university in the nation — the Wallace Energy Systems and Renewables Facility. “I feel like I've ended up in the perfect spot to contribute to the future of electricity. l am really excited to work with the Energy Systems group next year,” Meier says. Although he admits his high school dream of building the next great green technology might be a “bit ambitious” he is thankful that family, friends, and peers have always been supportive of his goals. With all his energy, anything seems possible.